As a 2004 member of the Jersey Surf , 22-year-old Alex Ozenberger has performed under the stadium lights of football fields across America in front of hundreds of thousands fans, but now he has millions on his mind, having had the opportunity to compete on an episode of "Who Wants to Be a Millionaire" that will air Wednesday, March 4. 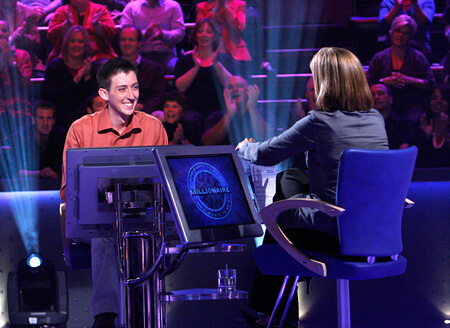 Hosted by television personality Meredith Vieira, "Who Wants to Be a Millionaire" is a game show where contestants have the chance to win cash prizes for correctly answering a series of multiple-choice questions of increasing difficulty. Alex Ozenberger in the "hot seat" with "Millionaire" host Meredith Vieira. Ozenberger, a native of Olney, Md., and a recent graduate of Syracuse University, will appear on an episode taped in New York City on October 6. "What struck me most is how fast it all went," he said about the experience. "Once I got called down to the stage everything was a blur. Sitting across from Meredith Vieira, the lights in my face, the audience cheering ... It was surreal. I'm looking forward to seeing the show on TV because honestly, I can't remember what I said." Auditioning in Hanover, Md., Ozenberger was invited with his mother and grandmother to New York City to compete in a special family edition of "Millionaire." "They ran out of time before we could be chosen to play, but the very next week, they called me back and invited me to appear by myself." As part of the game, "Millionaire" contestants are allowed to have up to three "phone-a-friends" on standby to assist in answering questions. Ozenberger kept his family in mind choosing his dad, Brad Ozenberger, who is director for the National Human Genome Research Institute in Bethesda, Md., and his uncle, Mike Lazzo, a lawyer from Wichita, Kan. He joked that his dad "militantly prepped" him for the "Millionaire" hot seat, and made sure that Alex watched "Millionaire" every day and reviewed all of the questions that he didn't know afterward. Though tight-lipped about how he fared as required by producers until the episode airs on Wednesday, Ozenberger talked freely about how he can relate his drum corps experience to his 15-minutes of television fame. "It's all about performing your best under pressure. I've always enjoyed the spotlight, whether it was playing a solo at the DCI World Championships, directing the pep band at Syracuse basketball games, or answering questions on 'Who Wants to Be a Millionaire." The key is just to stay cool and confident, and that's an ability that my drum corps experience in the Jersey Surf definitely helped me develop." Check local listings at MillionaireTV.com to find out when and where to see Ozenberger on Wednesday. Photo courtesy Valleycrest Productions Ltd.